In my research for Bill the Boy Wonder: The Secret Co-Creator of Batman, I dug deep and discovered quite a bit that had not been published before. 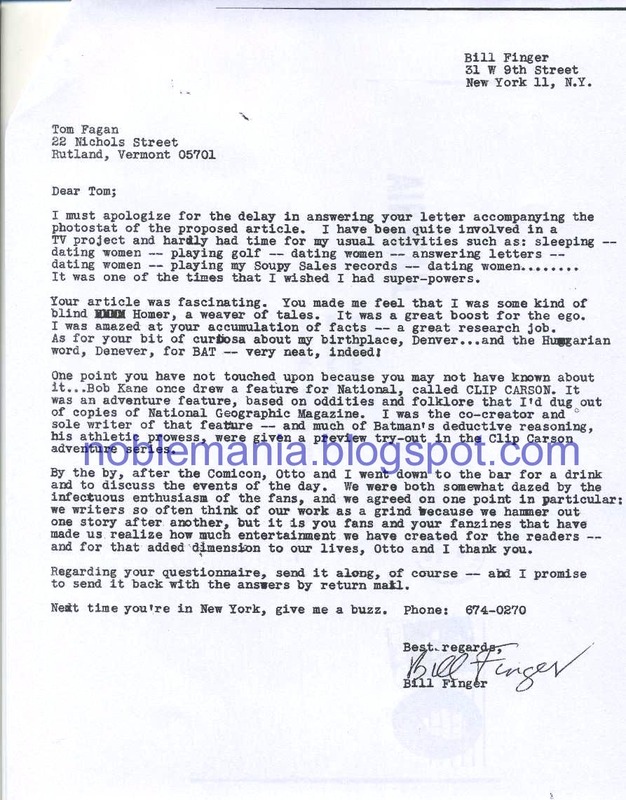 One of the most rewarding finds was personal correspondence—the only known examples of surviving letters written by Bill Finger. There are two, both from 1965. They were discovered in the Vermont home of longtime fan Tom Fagan, who passed away in 2008; a friend of Tom’s kindly mailed me copies. When I first saw the letters, everything quickened. It is understated to describe them as highlights of my research odyssey. Besides the simple fact that they exist, they are significant because they reveal sides of Bill’s personality that none of his (few) comics-related interviews did. The first letter (whose postmark, not shown here, is 8/19/65) starts with a doozy: in rattling off his interests, Bill cheekily repeats “dating women.” The last line of the letter is endearing and humanizing, and also shows that the phrase “give me a buzz,” which I would’ve assumed dated from the 1970s if not later, actually existed in the 1960s. Who knows—maybe Bill came up with that piece of pop culture, too? 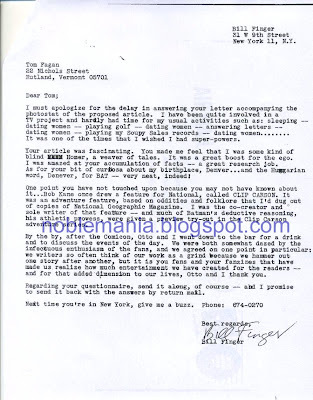 The second letter, dated 10/17/65, strikes a more solemn tone because it came in the aftermath of Bob Kane’s scathing letter for Batmania in which he refutes Bill’s recent admission that he (Bill) was involved with the creation of Batman. Bill wrote that he had to keep it short so he could make it to the post office before it closed, but 10/17/65 was a Sunday. It was so hastily written that Bill did not sign it. 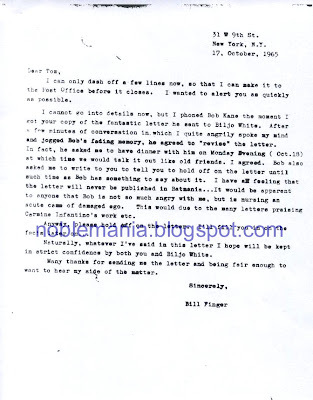 But the letter’s greatest significance is in the line “I quite angrily spoke my mind and jogged Bob’s fading memory.” As I mention in the Author’s Note, this is the most spine we have seen from Bill and, in fact, is the only known textual evidence in which Bill stood up for himself. The poignant last line also made it into my book…as the last line there, too. It’s heartbreaking in its graciousness. Imagine the bitterness it could have been masking. 2016 update: A third letter has been found. The phrase "give me a buzz" in the context being used by Finger means, "Telephone me." Or "drop by." The probable origin is in old apartment buildings without a doorman you would enter the lobby a buzz the apartment of the person you are looking for. There would be a sound perfectly described as a buzz in the apartment, and if the person was home they could buzz back which would unlock a security door in the lobby and give access to a stairway, or elevator. In your text you say the second letter was dated 10/19. But it's dated 10/17 which was a Sunday. That still doesn't match up with the Post Office being open though. Having come from a time before yours, I would like to add that Anonymous is correct about the 'buzz' line. The apartment buzz is probably correct but I remember my grandmother's phone making a buzzing noise and I often used the phrase myself. This was at a time when I was too young to know that it meant anything else and I'm pretty positive my granny was not baking anything more than pies! Thanks for the great article. You are fast becoming one of my favorite authors. Thanks Captain Blog! Kind words indeed. If I remember correctly, there was a time that the Post Office was open 7 days a week. But it was perhaps a half day, or something like that. "Bill the Boy Wonder" in "Washington Jewish Week"
Hometown newspapers on "Bill the Boy Wonder"
"How to Be a Baby by Me, the Big Sister"
My TED talk! On Bill Finger!